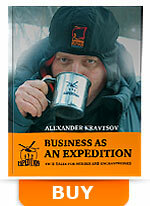 The book of A. Kravtsov “Business as an Expedition. True tales for heroes and enchantresses”. A new generation poetic business-guide. Bestseller, published in 15000 copies. The book is translated into English, Portuguese, Chinese and Lithuanian. Publication abroad is in process.